So how do you achieve the Millennium Development Goals to reduce poverty? Start with the schools. That's where the future is made. Ertharin Cousin, the director of the UN World Food Programme (WFP), says, "Schools are where we shape future political leaders, scientists, economists, artists and thinkers. Schools are where we nurture dreams and aspirations. Schools are where we lay the foundation for future economic growth." That leads to the next question. How do we get children in poor countries to attend school? Food is the key. WFP runs school feeding programs that ensure children have a meal when they get to class. This is an incentive for parents to send their children to school. Impoverished families struggle to get food on a daily basis. If parents know children will be fed they will send them to school rather than keeping them home to work. Once in school the food fights off hunger and vitamin deficiencies that stunt growth and development. Children are healthier, have more energy and can learn. 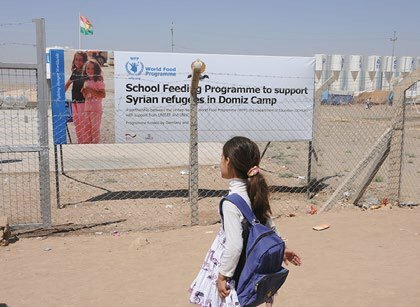 This is why WFP feeds Syrian refugee children at schools in Jordan and Iraq. Or why the school feeding in Haiti is so vital in the aftermath of a series of natural disasters. In the Central African Republic (CAR) children have suffered so much from conflict that has displaced over a million. The food shortages caused by the war have put that nation on the brink of famine. School seems an impossibility. But there WFP is feeding children a meal of rice and pulses at schools that have reopened. Donaig Ledu, a WFP officer, says, "The school principals have confirmed that the beginning of school feedings in Bangui (the capital of CAR) and the spreading of the word has had a decisive impact on school attendance." Food and education for children in war afflicted countries is a struggle to achieve. Sonia Khush of Save the Children says kids she met in war-torn South Sudan want to be back in school. They want that normalcy. Save the Children sets up temporary schools, but getting and training teachers is another problem. Even if you get those things, children that are starving will not learn. It's crucial to make sure there are enough resources for school feeding, particularly in countries that may have suffered through conflict, natural disasters or extreme poverty. The Central African Republic mission of WFP, for example, is very low on funding. This will limit what WFP can do as they rely entirely on voluntary donations. Over the years, there have been many instances where WFP has been forced to reduce school feeding rations because there was not enough funding from the international community. These are often in areas which really need the meals and rely on donations. "The coverage of school feeding programmes is lowest in countries where the need is the greatest... In low-income countries, however, donor investment accounts for 83 percent of the resources allocated to school feeding programmes." While U.S. programs like Food for Peace and McGovern-Dole are significant donors to WFP school meals, we can always do a little better. After World War II, U.S. food aid was dramatically increased to help nations recover from the destruction. Even with record setting levels, U.S. officials knew they had to do more to defeat the relentless enemy of hunger and poverty. This approach was key behind the success of the Marshall Plan to spur post-war recovery in Europe. At one point in Italy during 1945, relief officials were trying to figure out the best way to distribute food to children. Col. Bizzozero, a Public Health Officer, exclaimed, "You would have to go into the schools. Schools are the place to go." His colleague Mr. Silber of the Red Cross replied, "In that way we could furnish milk to children who need it, and at the same time stimulate school attendance." So if we want to achieve the MDGs and beyond, start with food at school. As Cousin says, "Eliminating hunger and chronic malnutrition unlocks the door to every single development objective, whether it is poverty eradication, education, health, equity or economic growth."